Being green means more than school spirit at the UO, something that becomes more apparent every year during Earth Week, when students, staff and community members unite to inspire their community to be healthier and more sustainable. The 46th annual Earth Week celebration at the UO is happening this week. A wide array of events are planned that aim to increase awareness on how to create a greener community. The events on each day follow a theme and include environmentally-focused activities surrounding food, transportation, zero waste, conservation and service. On Wednesday, the School of Journalism and Communication, College of Arts and Sciences and environmental studies will host former executive editor of National Geographic Dennis Dimick, who will give a public lecture on “The Big View: Climate Change in the Human Age.” This event is free and open to the public. The week of activities culminates on Friday, Earth Day, with three featured activities. Based on the success of the inaugural year of Analog U, undergraduate studies will sponsor the activity again this year. Analog U is a day of mindfulness that encourages students and staff to disconnect from electronic devices and reconnecting with nature, themselves and others. On the Collier House lawn, directly across from the Erb Memorial Union, yoga, meditation, gardening and crafting activities will take place. An Earth Day Celebration happens Friday at the EMU amphitheater from 10 a.m.–4 p.m. with 30 student and community organizations providing information on their causes and hosting activities. Bike-powered music, raffles and giveaways are among the activities. As in the previous years, LiveMove will have their occupied parking spot. Envision Journalism, a student organization, will have a photo booth. On Friday evening, Net Impact will host the annual Sustainable Practices Raising Net Growth Conference, known as SPRNG, which enhances the shared network of professionals dedicated to the triple bottom line paradigm of people, planet and profit. This year speakers and tablers will focus on the food industry. 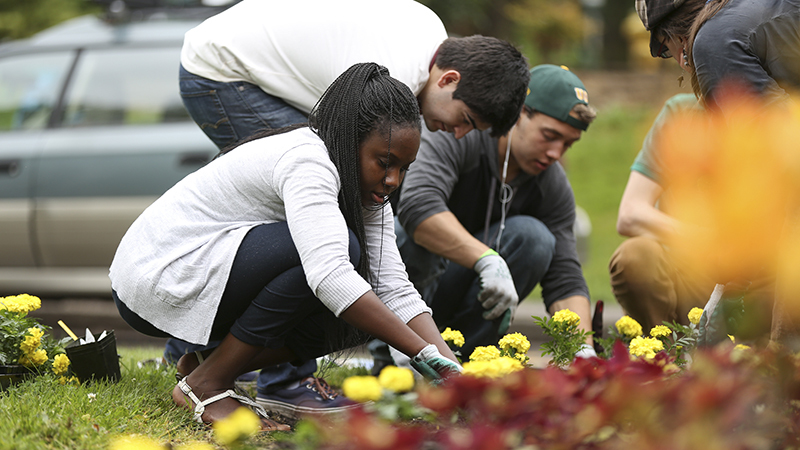 Then on Saturday, April 23, UO students will pour out into campus-area neighborhods for and Earth Day of Service to give back to the community and build stronger ties to the community. And while the week is aimed at creating awareness of and education on making a greener community, it is also a a time to cheer. “This is a week to celebrate. It comes at the end of the year, and a lot of student groups come together and celebrate the things they’ve accomplished at the university,” Erkan said. For more information on all the activities planned this week, visit ssc.uoregon.edu/events/earth-week/.